Many people tend to postpone addressing painful conditions with their feet or ankles. Often, people believe that pain in their feet is just something they have to live with. Perhaps the most common complaint of our patients with persistent pain is bunions. Bunions are generally progressive and the pain also increases with time. Many people wait too long to address the issue and continue to wear improperly fitting footwear that increases the sensitivity. When the pain becomes significant enough patients seek our treatment. Non-surgical treatments are preferred by both doctor and patient, however as the bunion continues to progress untreated non-surgical treatments become less effective. If a bunion disorder progresses to the point when surgery is needed, what are the options? Bunion surgery is an ambulatory procedure. This means that the procedure is performed in an outpatient setting (we perform these in our own ambulatory surgery center located in our office) and typically takes an hour or two to perform the surgery. Initial evaluation including x-rays and a gait analysis will be performed. The surgery is typically performed with a local anesthesia and either Arthroplasty or Osteotomy is performed. These procedures will reshape or cut the protrusion and typically titanium screws are inserted. The surgical screws will hold the bones in the new corrected position and provide long term stability to the area. The surgery in painless with minimal discomfort the during recovery period, which is treated with over the counter pain relievers. Dependent upon the severity and degree of correction, many patients are back on their feet in a few days. What can be done to avoid surgery for my bunions? 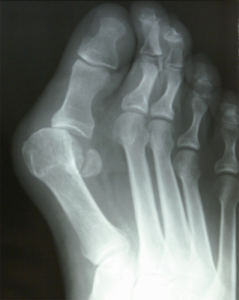 Non-surgical bunion treatments mostly attempt to mitigate the pain associated with bunions. These include changing your footwear and specifically avoiding narrow or pointed shoes. Padding and taping will provide some cushion to the area and may reduce friction, swelling and sensitivity. Orthotics or shoe inserts can provide relief. Over the counter shoe inserts can be helpful, however the best orthotics are custom made, prescription orthotics. These prescription orthotics are made specifically to address your unique issues that many of the over the counter orthotics cannot address.